After a marvelous Apogaea 2013: Alchemy and some much needed R & R, all nine (9) board members, thirteen (13) Ignition members and two (2) members of the community convened for the July board meeting. A panel-like Q&A “meet-n-greet” commenced just after the meeting ended, giving Ignition (the voting members of the Apo org) a chance to learn about the board candidates seeking to replace the three outbound board members who’ve fulfilled their terms (Kingpin, Sean Sidelko, and Matt Stringer – kudos guys!). Caroshine, Ignition Fluffer, has a goal to coordinate a monthly Ignition mixer and would like feedback and ideas of what could be covered at these monthly gatherings to promote learning and collaboration. Please email Caroshine with your ideas or feedback! Bobalicious announced that Denver Decompression 2013 is now in the planning stages, and encouraged those who are interested to come take part. Everyone is welcome! 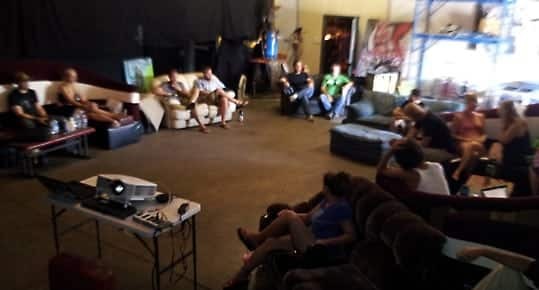 You can join the Denver Decompression Facebook Steering Group to see how you can get involved. Megan announced that SLAP has been renamed to “LOVERS” – they intend to present a plan to work more closely with Apogaea in order to fulfill their mutual interests. Kingpin proposed that the board push back a few dates in the timeline to not only accommodate the Burning Man “deadzone,’ but also to affect a cascading series of changes such as an earlier art budget decision/announcement, an earlier art fair, and hence an earlier ticket sales start date. September BOD meeting: Sunday, 9/29/13 – announce population, ticket price, # of days for the event, budget. Vice President, April ‘Glitterati” commended Ground Control on the great job with volunteer tracking this year. She added that there seemed to be less flaking. She’ll present the organized data that was tracked to the new board. Treasurer, Steve M. reviewed the monies and stuff. The finance committee met 8 times to make sure all reimbursement requests they received were fulfilled. Thanks for all your hard work! The awesome news is that though there are still some pending reimbursements, the event was still under budget. The actual numbers will be published later this year. Even with a larger event, Ground Control and all those involved kept within the budget. Woo hoo! Secretary, MissAlicious: the BOD unanimously ratified the May board meeting minutes to be stored on the wiki for the record. It was also recommended that an Ember Reports Lead and Census Lead for Apogaea 2014 need to be created. Every Ignition member needs to complete and submit an Ember Report! Ember Reports allow Ignition to record their department’s best practices, what to avoid in the future and ideas for improvement, etc. James Whiddon has done an excellent job in taking the lead in order to create a form to submit. Information will be easily organized from the form. It was agreed that the past process allowed for more discussion because Ignition could see every Ember Report each time it was submitted. The BOD decided it needs to be determined how the reports will be distributed to Ignition to incite that good ‘ol discussion. For 2014, it will likely work better to hold fewer people (i.e. only Ground Control) accountable for budget items to ensure cost savings and to avoid duplication of effort or spending. Call out for Apogaea Officers Nominees! Welcome Apogaea 2014 Board of Directors & Officers!